“Energy brings energy,” Louise Lecavalier said, when asked about the work and stamina required to create and perform a dance work, recalling her years working with Edouard Locke of La La La Human Steps. Tonight, you become the first American audiences to witness the first work of choreography from a woman who has already made an unmistakable mark in contemporary dance. So Blue stands alone as a compelling piece of work in the art of performance, but it also marks an important milestone in the life of an artist—an artist who has given so much and inspired so many. Throughout the 1980s and 1990s you may have seen her whirling across the stage in jaw-dropping barrel rolls, her long blond locks whipping along as she practically levitated parallel to the stage. She dominates, she relents as she makes shapes in the air and she elevates the heart rate of all who witness. spotlight on this exceptional performer at an exciting and critical point in the trajectory of her artistic life. One of our rallying cries this season has been “The Body is Beautiful. Get Used to It.” You’ve likely seen our banners or flyers singing out this message—it is a truism that applies not only to the art of dance, but to the art of living. What a privilege it is to have a body, to possess physical strength and vitality. And what a privilege it is to witness an artist like Louise Lecavalier who, with tenacity and tenderness, great prowess and graceful creative intellect, shows us time and again, just how beautiful the body is and what it is capable of. We thank you for bringing your own energy to this hall tonight, in honor of this indomitable artist. Energy begets energy. We feel it when you bring it, the artists on stage feel it, and we share it here together. That’s what it’s all about. Please linger with us after the performance as we toast Louise and hear more about her creative process. Thank you for helping us welcome her to Los Angeles. We’ve been obsessed with poetry around here lately, on a mission to incorporate it into our lives more fully. 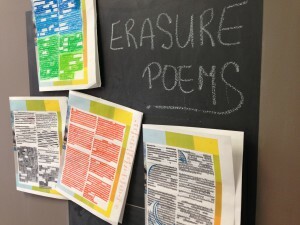 As part of this ongoing exploration, last year we met Mary Ruefle, a master of erasure poetry who taught us this simple but profound practice of taking written words, marking some of them out and unveiling something wholly new. There is a lot of poetry to be found in the upcoming season. Explore the 2014-2015 calendar up today on our website. And there will be much more to come from us in the next few months– a new website, and the official season brochure hits mailboxes in the next couple of days, keep an eye out. We took a pause from the frenzy to sit down with some of that information and in the name of poetry, erase it. If you’ve ever encountered our artistic and executive director Kristy Edmunds, you know how eloquent and inspiring her words can be. Figuring they would make for prime poetic fodder, several staffers here took Kristy’s welcome letter from our season program guide, and turned it into an erasure project. Here’s what we covered and uncovered. We ‘re looking forward to everything we may unearth in the coming season. We are collaborating with L.A.